Fundraising is well under way for a new athletic facility that could look something like this preliminary rendering. 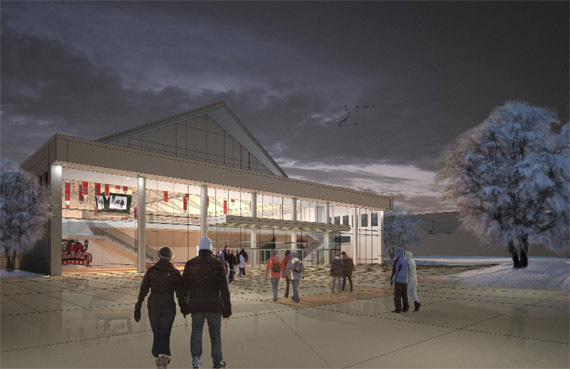 Last weekend, Colgate’s Board of Trustees voted unanimously in favor of the construction of a new $37.8 million, 97,000-square-foot athletic facility, contingent on the receipt of $25 million in gifts. So far, commitments toward the project total $20.8 million from alumni, families, and friends. The new facility will be adjacent to Reid Athletic Center, and feature a hockey rink, locker rooms, training and meeting space, and offices for coaches of the men’s and women’s ice hockey, lacrosse, and soccer programs. It also would allow for the eventual repurposing of Starr Rink for practice facilities. The decision to move forward on the new athletic facility continues the momentum established with the construction and renovation of academic buildings, including the Case Library and Geyer Center for Information Technology, the Robert H.N. Ho Interdisciplinary Science Center, and Lathrop Hall. The board’s actions guarantee that the project’s funding will be aligned with the academic priorities of the operating budget.